In 2005, Economica conducted a survey of the cost of obtaining household services (see The Expert Witness, Vol. 11, No. 2, Summer 2006). At that time, we found that housecleaners in Calgary and Edmonton charged approximately $25.00 per hour; and that handymen charged approximately $33.00 per hour. Since that time, we have estimated the current costs of household services by increasing the 2005 estimates by the intervening rate of inflation in Alberta. This implies, for example, that our estimate of the cost of housecleaners was approximately $27.50 per hour in 2010. Increasingly, however, we have become aware that our estimates differ from the rates that prevail in Alberta, particularly in Calgary and Edmonton. The informal evidence available to us suggests, for example, that many housecleaners now charge more than $30 per hour. For this reason, in late 2009 and early 2010 we conducted a new survey of household costs. In this survey, we obtained housecleaning, handyman, landscaping and snow removal, child care, and home care/meal preparation rates from a large sample of agencies and individuals in both Calgary and Edmonton, and housecleaning rates for smaller samples in Lethbridge, Grande Prairie, Red Deer, and Medicine Hat. We report the results of that survey in this article. Using the internet, we identified five professional agencies (for example, Molly Maid) in Calgary and four in Edmonton that provide house cleaning; and we identified nineteen Kijiji or Craigslist ads (usually from individuals) in Calgary and twenty-five in Edmonton. In each case, we attempted to obtain an hourly rate to clean a 1600 square foot, two story house, assuming there were no pets and that the cleaner would not be responsible for the basement. In Calgary, the average rate among professional agencies was $36.63 per hour, with a range from $24.00 to $45.00. The comparable average for Edmonton was $34.50, with a range from $20.00 to $41.25. Among those who advertised on Kijiji or Craigslist, the average hourly rate was $23.76 in Calgary and $23.44 in Edmonton, (with over seventy percent of the rates falling between $20.00 and $25.00). In the smaller cities, all of our data came from Kijiji or Craigslist ads. In those cities, the average hourly rates (with numbers of ads in brackets) were: Lethbridge (16), $20.81; Red Deer (7), $20.00; Medicine Hat (4), $23.75; and Grande Prairie (7), $18.71. An important question is raised by the deviation between the rates charged by professional services and those by individuals: if individuals charge, say, $20 to $25 per hour, and agencies charge $30 to $40 per hour, why do clients hire the professional firms? We suspect that the answer to this question derives from three factors: First, agencies may be able to offer a higher quality of service than can private individuals. For example, they might provide training to their employees, use screening interviews to select the most skilled workers, or offer to replace workers who proved to be unacceptable to the client. Second, it is possible that agencies might be able to complete their tasks more quickly than will private contractors, thereby lowering the effective hourly rate of the former. Regardless of the answer to this question, however, the fact is that it would be very difficult to hire a reliable housecleaner in Calgary or Edmonton for less than $20 per hour – and that cost would rise to more than $30 per hour if the client wished to hire a bonded cleaning service. We obtained the names of handyman services in Calgary and Edmonton from Kijiji and Craigslist. In each case, we attempted to obtain quotes to: “replace several fence boards, clean and repair the gutters, and paint the step rails and trim.” If those rates were not available in the ads, we phoned to obtain them. The average hourly rate among twenty-six services in Calgary was $24.88; whereas the average in Edmonton, among twenty-one services, was $29.24. In both cities, approximately half of the responses fell between $20.00 and $30.00, with the difference in the cities’ averages resulting primarily because a larger number of individuals quoted less than $20.00 per hour in Calgary (nine out of twenty-six) than in Edmonton (two out of twenty-one). Again, lawn care and snow removal firms were identified from Kijiji and Craigslist ads in Calgary and Edmonton. With respect to lawn care, we asked for a quote on a suburban city lot (4200 sq ft lot with an 1800 sq ft two story home) with lawn in front and back. With respect to snow removal, we obtained quotes for a house with a two car driveway, stairs, entry and a city sidewalk. In all cases, firms quoted either per attendance at the home or per month (i.e. not per hour). The twenty-six lawn care firms in Calgary charged an average of $29.71 per attendance (with the majority between $25 and $35) and the thirteen firms in Edmonton averaged $36.15 (with the majority between $30 and $40). With respect to snow removal, the six Calgary firms that charged per attendance averaged $26.67, whereas the five Edmonton firms averaged $33.80. One Calgary firm charged a flat rate of $100 per month and one charged $140 per month. We identify five methods of providing (commercial) child care: day care, day home, live-in nanny, live-out nanny, and before- and after-school care. We obtained all of our information from various internet sites. 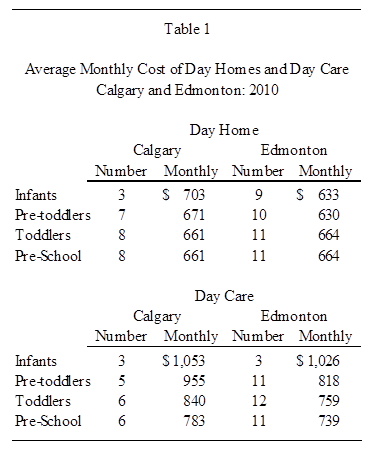 The numbers of day cares and day homes that were contacted in Calgary and Edmonton, and their average monthly fees, are reported in Table 1. There it is seen that day homes charge approximately $650 to $700 per month for all ages of children; and that day cares charge approximately $1,000 per month for infants and from $750 to $900 for other age groups. The average monthly rate for the thirteen live-in nannies we identified in Calgary was $1,763; and for thirteen live-out nannies (also in Calgary) the rate was $1,683. In Edmonton, many nannies reported hourly rates. Assuming that those rates applied to forty-hour weeks, the ten live-in nannies charged an average of $1,770 per month and the eleven live-out nannies charged $1,912. The average monthly rate for before- and after-school care was found to be $401 in Calgary and $415 in Edmonton. We were able to identify four agencies in Calgary that provide generalized home care services, such as meal preparation, light housekeeping, grocery and clothes shopping, grooming and dressing, bed-making, and bathing. In each case, we sought a quote for “a relative that had been injured in an accident and was recuperating at home.” The average hourly rate among these agencies was $24.81. In Edmonton, we found only one agency (We Care), which charged $27.75 per hour. However, we also identified two individuals on Kijiji, who charged $14.00 per hour and $15.00 per hour, respectively. In this article, we have reported the results of a survey of household services providers in Alberta. Two outcomes are very clear. First, it is inappropriate to use a single, hourly rate to evaluate all such services. Whereas child care services cost approximately $5.00 per hour per child (assuming that nannies care for two children on average), housecleaning services cost more than $25 per hour, and lawn care and snow removal can cost over $30 per visit. Second, the convention of using $12 to $16 per hour for household services is insupportable. All of the services that were identified in our survey either cost significantly less that that – for example, childcare – or significantly more – for example, housecleaning, lawn care, and handyman services. Our findings also suggest that it may be inappropriate to rely on the wage rates reported by Statistics Canada to estimate the costs of services such as housecleaning. Whereas the wages for that occupation average approximately $15 per hour, the individual housecleaners we identified through Kijiji and Craigslist charged more than $22.00 per hour on average; and housecleaning agencies charged more than $30 per hour (more than twice the wage that Statistics Canada reports). Statistics Canada provides data concerning the amounts of time spent on six types of “household work and related activities.” These are: cooking/washing up, house cleaning and laundry, maintenance and repair, other household work, shopping for goods and services, and primary child care. For the purposes of calculating the costs of household services, we propose to combine “cooking/washing up” with “shopping” and evaluate that category at the approximate average rate for home care and meal preparation, $25.00 per hour (up from $20.00 per hour in our 2005 survey). We will combine “maintenance and repair” with “other household work” (a large portion of which consists of “gardening and ground work”) and evaluate the resulting services at the landscaping, snow removal, and handyman services rate of approximately $30.00 per hour (down from $32.00 in 2005). We will evaluate “house cleaning and laundry” at the rate for housecleaning services. For the purposes of our reports, we propose to use the conservative rate of $30.00 per hour in Calgary and Edmonton, and $20.00 per hour elsewhere (compared to $25.00 and $20.00, respectively, in 2005). Finally, we will assume that it costs $850 per month to care for each baby (the approximate mid-point of day care and home care costs), $800 to care for each toddler/pre-school child, and $400 per month to provide after-school care for each school-aged child (up from $700, $600, and $275, respectively, in 2005).